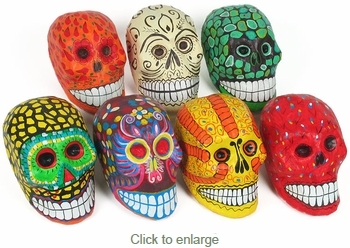 These handpainted paper mache skulls with unique designs will add a colorful touch to your Day of the Dead display or any Mexican folk art decor. All of our paper mache skulls are handcrafted by folk artists in Mexico. These are individual works of art, expect variations in color and design on these paper mache calaveras (skulls). Assorted: You may specify color in the comments section during checkout, otherwise we will choose from our available stock.Price is for one skull.